Every week, after swimming lessons, my daughter and I walk to the ice cream shop and treat ourselves to a scoop. Since I have genetically high cholesterol, I've been cutting back on egg yolks and dairy products that are high in milk fat (e.g. heavy cream). Traditional homemade ice cream contains plenty of both. Sure, I tried a few methods to make it at home. All of them were fairly messy and I never seemed to get the consistency quite right. But last week, my daughter received a Zoku ice cream maker from her cousins. I was excited to try it out since I absolutely love our Zoku popsicle maker. I didn't need any inspiration, actually. Just the thought of making a mess-free version of homemade ice cream was enough to motivate me. My favourite flavour is chocolate peanut butter. But since my daughter cannot have peanuts, I thought I'd make it with WowButter instead. After making Magic WowButter Pillow Cookies, I had a bunch of WowButter centers leftover. I kept them in the freezer. Well, these were the perfect addition to our frozen chocolate dairy creation. (If you need to make them, don't worry, you only need two ingredients). I loosely based my recipe on the one included in the Zoku instructions. It called for 1.5 cups of whole milk and 1.5 cups of heavy cream. I just used two cans of unsweetened evaporated milk instead. The WowButter bites are made by combining equal amounts of WowButter and pure icing sugar. And since WowButter is an easy 1 for 1 peanut butter substitute, you could use the latter instead (provided you don't have a peanut allergy). Be sure to use mild soapy water to wash the unit and nothing abrasive on it. The silicone ring (I'm assuming it's silicone) easily comes out of its slot. Since you'll be scraping the ice cream on it (as it forms), it's important to take this ring out and wash it thoroughly. I store the metal bowl part (with the silicone ring inserted properly in its slot) in a ziploc bag in the freezer. It keeps it clean and ready for use. It's important to keep it in an upright position in the freezer for the fluid contained inside the unit. I keep the outer bowl and cool-looking spatula it comes with in the cupboard. I'm pretty sure the outer bowl is just to protect your fingers from freezing while you stir. Bonus: The spatula it comes with is excellent for icing my G-F WowButter Carrot Cake. 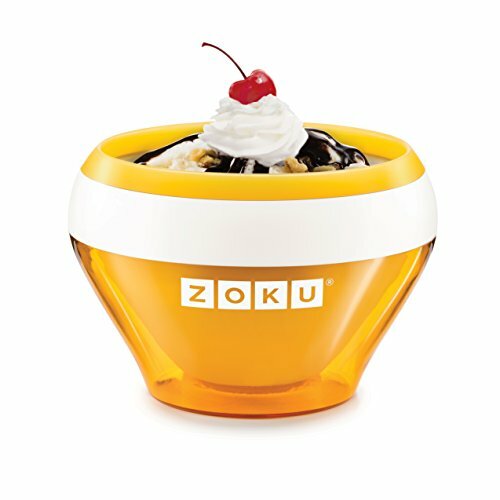 What I like most about Zoku's products are they work without electricity. The refrigerant liquid is non-toxic (and it remains safely sealed inside). Note: You should never put the Zoku unit in the dishwasher. It's fascinating to watch ice cream form as you mix it. In the past, I'd rely on the freezer to do the work - but I could never stay on top of preventing ice crystals from forming. Plus it took too long. Zoku speeds up the freezing process immensely. In just 10 minutes you can enjoy a soft serve dairy dessert (I like it hard, so I put it back in the freezer for 10 more minutes). I attempted a homemade video of how this unit works, but mine wasn't nearly as good as this next one by the Cooking Club of America. My cat Kady kept getting in the way and my house is a bit messy. TIP: Break up any lumps of cocoa by using the back of a spoon and squishing them against the sides of the bowl. In a large bowl, combine evaporated milk, sugar, cocoa powder, vanilla, and salt. Whisk until everything is incorporated. Cover and chill in the fridge (not freezer) for 30 minutes. Credit: RoseWrites on InfoBarrel / All rights reservedIn a small bowl, combine WowButter (or peanut butter) with pure icing sugar. Sprinkle some icing sugar on a plate and keep near mixture. With clean hands, scoop out about 1 tsp. of the mixture, roll it between you palms to form a ball, and place on plate. A light dusting of icing sugar on your palms will keep them from sticking to your hands. Repeat until you run out of mix. Keep WowButter bites in the freezer. Store unused ones in a sealed container or bag. Note: You will not have good results if you overfill the Zoku unit (trust me). After freezing the Zoku unit for at least 12 hours, place it on a counter where you can easily stir (without elbowing anything or anybody). Pull out large bowl from fridge and give everything a good stir. I use my whisk. The cocoa has a tendency to "settle" to the bottom. I use a measuring cup to ensure I don't exceed 5 oz. worth of fluid. I know, only 5 ounces. But it's the most heavenly 5 ounces. Remember: you can make up the base recipe ahead of time and keep it in the fridge. It yields about a quart of ice cream. By making only 5 ounces at a time, I feel it helps with portion control. As soon as you are done pouring the mix into the Zoku, start scraping the sides of the bowl (as shown in the previous video). It's essential that you continue to do this until a "soft serve" consistency is formed. When it reaches a pudding-like texture, I add a few WowButter bites (from the freezer) and continue to mash them into the mix. Using frozen WowButter bites helps solidify the ice cream as well. Place Zoku bowl back in freezer for about 10 more minutes (if you like it hard, like me). If not, you can try it softer. If you continue to make more (one after another) the unit tends to need more time with each use. I've only made two at any one time, though. I would give this a 5-Star rating if it made more than 5 oz. worth at a time. Good to know it's BPA and phthalate-free and comes in your choice of six colours. Apparently (and I did not know this) these bowls can be stacked upright in your freezer in case you want to have a few handy. Run! It's the Chocolate Jabba the Hutt Monster! I'm impressed with this ice cream maker. Ours is electric, plugs in, and is about as loud as an airplane. And I'm glad you can make ice cream that fits with your dietary requirements! Thanks Jonathan. I like how it forces me to maintain portion control. It's too easy to overindulge in ice cream without realizing it. Plus, compared to gourmet ice creams, it's more cost efficient to make my own ice cream mix at home (and healthier). Another way to thicken the ice cream (which I forgot to mention) would be to substitute some of the evaporated milk for Greek yogurt. Thanks for dropping by and commenting.